The islands Capraia, Corsica and Elba are within sailing distance of La Spezia. For this route, the term stages rather than days is used as this trip may change along the way according to winds and distances you like to sail each day. Note that stages 1 and 6 take multiple days. This means you need two to three weeks to fully enjoy the Islands Route. 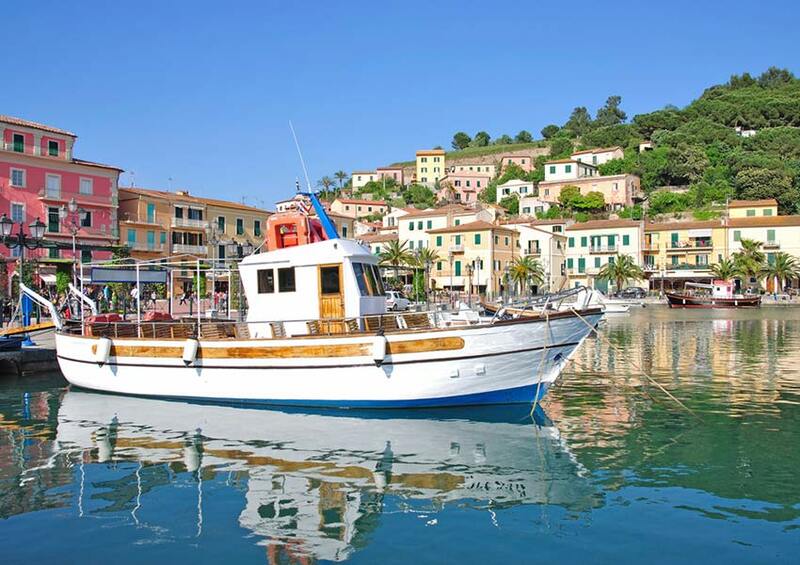 This leg will take you to Portoferraio, our first stop on the island of Elba. You need a few days to cover this part taking into account the winds and currents. Feel free to contact us in order to discuss potential ports for overnight stays along stage 1. 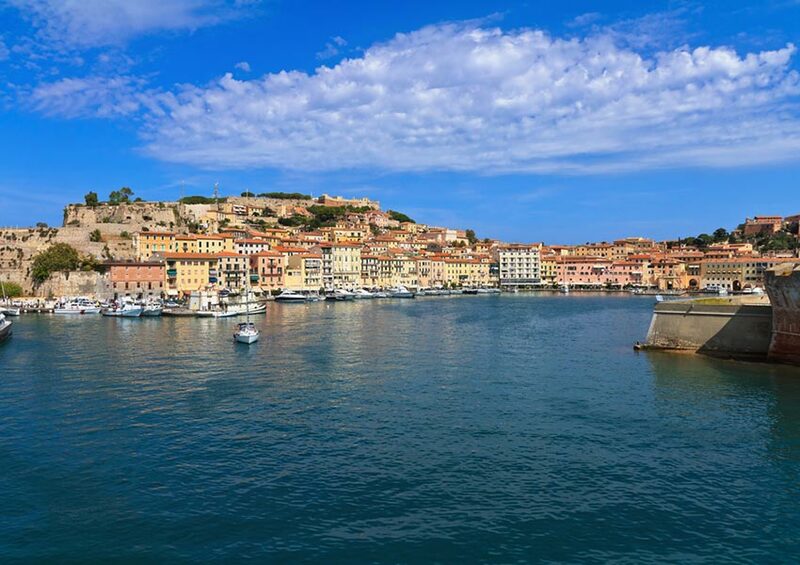 After Napoleon was exiled to Elba in 1814, he made Portoferraio the capital of the island. Thanks to economic reformations he carried out, the city became profitable by shipping iron ore to the Italian mainland. The center of this old city is built around the harbour and the bars and authentic restaurants in the area will make your visit even better. When you organise your private sailing holiday in mid April, you can enjoy a food festival with octopus as the main theme called Polpando e gli antichi sapori. Fans of international jazz and classical music should book the yacht for a week in September. That’s because the festival Elba Isola Musicale d’Europa takes place in September. Check the details of this international music festival on the official website. You can observe Elba’s beautiful nature and steep cliffs while you sail around the island. 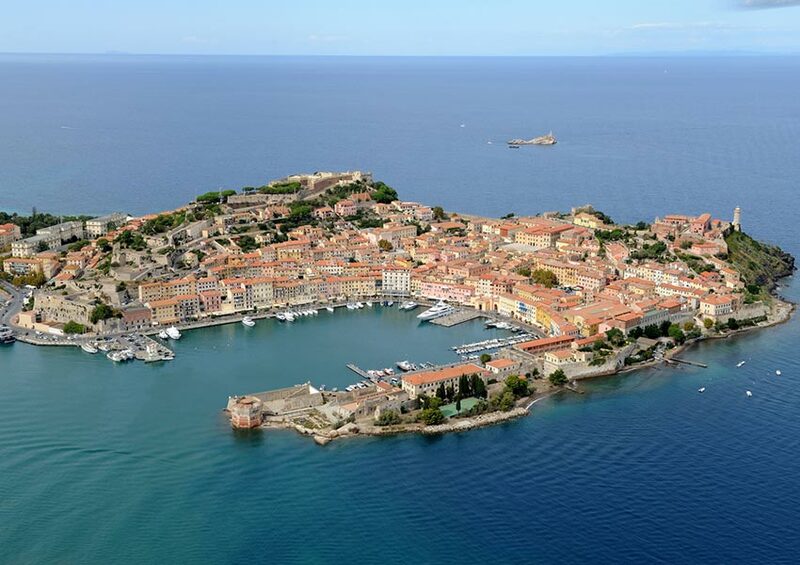 When northeast of Elba island, you can sail between the Isola Palmaiola with its ancient lighthouse and Isola Cèrboli. Near these small islands, you can find perfect spots to anchor and go for a swim. Or you can take out the Williams jet tender and explore the shores from nearby. 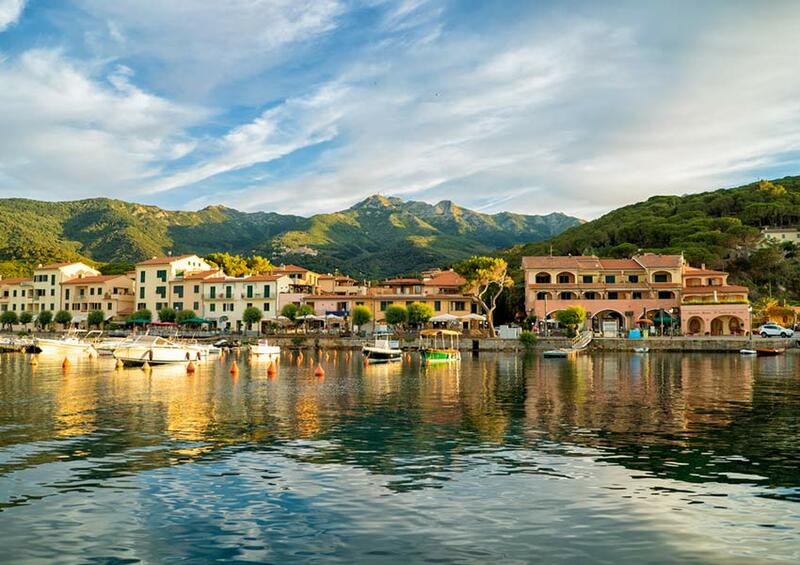 After a satisfying day of island hopping, you arrive at the Porto Azzurro marina. This is a former fishing village protected by a bay. You can find the town square with its many restaurants right next to the marina. This ancient town located between Monte Giove and Monte Perrone is the smallest town on Elba, covering only five square kilometres. When staying for some time, make sure to visit the mountain villages Poggio and Marciana to get some amazing views over the Mediterranean. A great place to have lunch or to have a drink is the La Dolce Vita Bar located in the tiny mountain village Poggio. The views over the island and the Marciana Marina are spectacular here. You could also use the cable car to get to the top of Monte Capanne, the highest mountain of Elba. You can find the cable car in the municipality Pozzatello, just off the town centre of Marciana. It’s a great adventure and you will enjoy the panoramic views over Elba, other islands of the Tuscan archipelago and the Mediterranean Sea. During the summer period, the nightlife at Marciana Marina is at its best. Enjoy a drink in one of the bars or have a delicious meal in one of the restaurants. This village is known for its honest and delicious wines. Hence, you should definitely taste them. 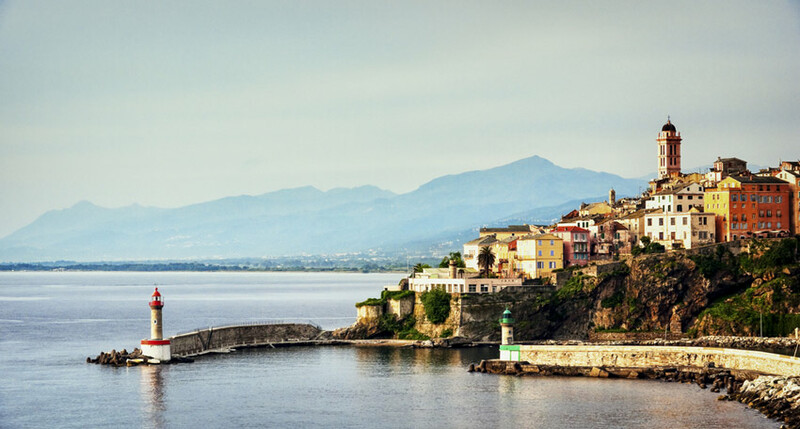 We sail from Italy to France and arrive in Bastia, the main port and busy commercial centre of Corsica. Take a walk from the Vieux Port to the citadel and stroll through the small streets of the city. When you are at the harbour on Saturday or Sunday morning, visit the traditional market on the main square on the Place du Marché. A short walk from the city, you can find the 19th century chapel Notre Dame de Monserrato. This chapel is not very impressive from the outside but its interior is breathtaking. Capraia is a small island off the Tuscan coast. Wine and anchovy fishery are the specialities of this tiny island. Call in advance to reserve a mooring place as there are only a few berths. Near the port, one of the island’s three coastal watchtowers can be found. Next to this Torre del Porto, you will find the San Antonio church. The walk uphill is more than compensated by the astonishing view. Seafood is the island’s speciality, so you can either go to a local restaurant or buy some fresh fish and cook it on the outside grill at the yacht’s stern. One of the boats on the video can actually be you on our sailing yacht! Discovering this pearl in the Mediterranean together with friends and family has never been easier. Book now or contact us to create your own custom sailing itinerary. Sailing back to the home port after this astonishing Islands Route, you will have some time to reflect on the marvellous sights and experiences along the way. Have a look at other potential Italian sailing routes or simply contact us to create your personal sailing itinerary. Simply communicate your needs and wants and we will do the rest.